Thanks for the emails and messages on Twitter – my Mum and Dad have finally managed to get out of Cairo, and are flying to the UK as I type. I feel as if I haven’t exhaled in a week. It’ll be good to have them home. I met up with my most excellent Auntie L in San Jose for a couple of meals last week. Apparently she rang my Dad before seeing me to check whether it’d be OK to eat in what she terms “hole-in-the-wall joints” (like many people who read this blog, she’d somehow conceived the opinion that I don’t go to restaurants that don’t have Michelin stars). Dad, of course, said that holes in the wall were just the thing, so Auntie L and I found ourselves at Da Lat (408 E William St, 95112 San Jose. 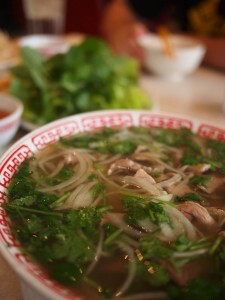 Tel (408) 294-6989) for Vietnamese noodle soup. The Vietnamese, not content with having invented the world’s best sandwich in the banh mi, also make a contender for the world’s best soup. Pho, like so many of my favourite dishes, has a mixed heritage, with some of its roots in French (the beef, not eaten in Vietnam until the colonial era) and Chinese (the rice noodles) cuisine. The name of the dish is pronounced “fuh”, a little like the French “feu”, possibly deriving from the pot au feu that the colonial French were eating. Surprisingly, for something that tastes as if it’s been developed over centuries, it’s only been around for about a hundred years. A good pho is all about the stock, a broth made with beef bones, browned onions and a mixture of spices, cooked over many hours. The dish succeeds or fails based on its broth, and the broth that my aunt found in a tiny, dark restaurant opposite a garage in the middle of nowhere in suburban San Jose was about as good as you’ll find anywhere. (So good, in fact, that I dropped in very quickly for another bowl on my way out of town the next day.) Get there early; the local police and fire service are based nearby, and Da Lat fills up very quickly after 12 o clock with lunching men in uniform and a huge number of local Vietnamese people. Auntie L says that Da Lat reminds her of the restaurants we used to visit together when she lived in Malaysia, all the emphasis on the food rather than the interior. It’s clean, but the decor is ancient, and in places a bit peely in that way that formica gets after a couple of decades. It all goes to give the restaurant bundles of character, to go with the bundles of beansprouts you’ll be scattering in your pho. My aunt and I weren’t the only people doing intergenerational lunch – tucked in among all the policemen and firemen there were Vietamese grandparents spooning soup into their grandchildren, a group of old gentlemen saying something instructive in Vietnamese to two young men over a table straining to bear the weight of all the food they’d ordered, and a few mother/daughter (or possibly aunt/niece) tables. It’s worth opening proceedings with the banh xeo, a crisp savoury crepe made with rice flour, filled with pork and prawns and studded with beansprouts and herbs. Wrap a mouthful in a piece of lettuce leaf with some of the fresh coriander and mint that has been put on the table, and dip it all in the nuoc cham, a strong, piquant sauce made from fish sauce, garlic, chillies and palm sugar. 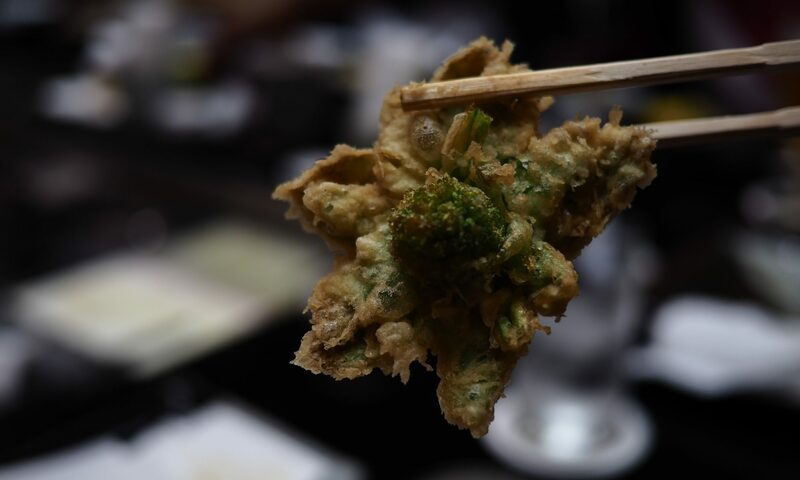 We also tried the fat, fresh battered prawns, and some spring rolls or cha gio (there’s a recipe for cha gio here on Gastronomy Domine if you fancy making your own). It’s not all soups and starters – Dr W ordered a platter of pork dishes so good that he overate quite spectacularly. Auntie L recommends you try the Mi Da Lat Dac Biet (no 59 on the menu), a house special noodle soup that comes with a crab claw sticking out of it and plenty of pork and seafood lurking in the bottom of the bowl; she ordered it “dry”, with the soup broth on one side and the noodles in a separate bowl, which seems to be a popular way of doing things. I kept it traditional by ordering Pho Dac Biet: beef pho. What can I say? Glorious stuff, with a broth simultaneously rich and light – it’s unusual for me to finish off a whole bowl of noodle soup, especially when it’s this big, but with the juice of a lime squirted into it, a handful of herbs stirred through and a big fist of beansprouts dolloped on top, this stuff is as good as it gets. It’s cheap, too. 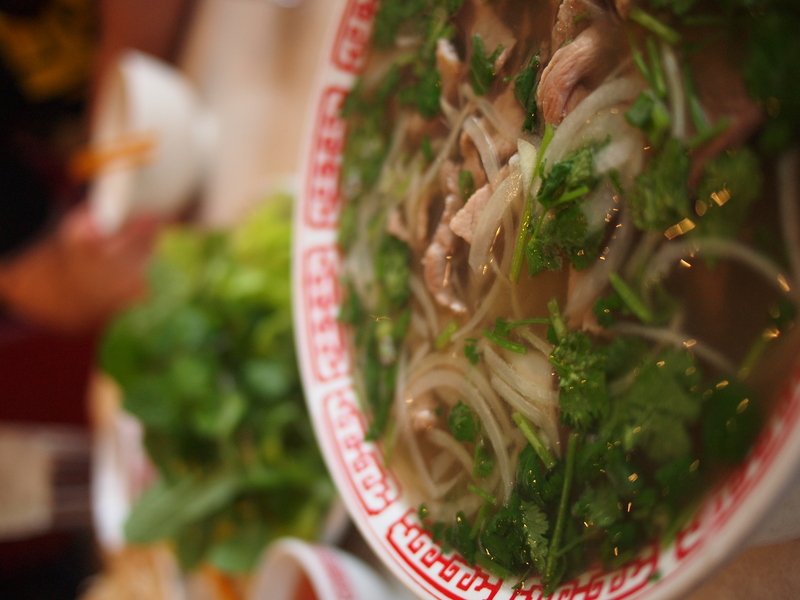 That bowl of pho was only $7.95 – less than you’d spend on a meal at McDonald’s. Bring the family and eat yourself silly. Yummm! The pho looks really really good. Best I’ve had is in Le Bambou near Place d’Italie in Paris. Highly recommended although the menu is completely in Vietnamese so a lot of looking around the restaurant and pointing is in order. The language thing is a problem in quite a few Vietnamese places; in Little Saigon in Orange County, I’ve been to a few where, again, you have to point or guess – guessing has resulted in some rather unconventional meals. I resorted to pointing again the day we accidentally ordered something which seems to have been a sort of liver pate, some noodles *with nothing on them*…and a bowl of pho. Your “most excellent Auntie L” is so pleased that you enjoyed Da Lat. 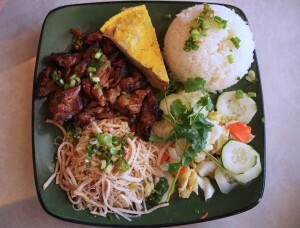 Next time you are in San Jose, she knows where to find the best banh mi too! Hello, most excellent aunt! Next time I’m in the neighbourhood, I propose kidnapping you and taking you to SF to show me some holes-in-walls. Thanks again – we had a really lovely time.